There’s this woman I know, named Lise. I always say “she’s my friend’s mom” but actually she’s my friend too, so I’ll just say that. I have this friend name Lise. Lise is easily one of the most interesting women I’ve ever known. Interesting is an understatement, but even more than that, Lise sparks inspiration in a very lonely part of me that’s just so rarely sparked. We first met back in the early 2000s, like 2002? I think? She was managing the coffee shop where I worked, and she was also the baker, and I was an opener, which meant we would have these strange few hours together in the very earliest morning, before dawn, smack dab in the middle of a dark and deserted downtown, and that sort of eerie setting makes for some really cool conversation. Lise baked confections and named them for dead writers. “If Bukowski Were A Cupcake!“, the sign would read. She once told the entire story of my first true love, which she was watching unfold in real time, through an elaborate series of angel food cakes. Over the course of months and months. Glorious start to grisly, miserable finish – all captured in cake (those Ooh-La-La Cakes were legendary, man I should tell that story sometime). Anyway, why is Lise so inspiring? Because, well, she is basically Bohemia incarnate. She is my proof that you don’t have to “grow out of it”, or at least that you don’t have to grow into that place that almost everyone seems to grow into. That you don’t have to become muted. Because Lise is so fiercely authentic, so living-breathing-being her creative self, all the time, and that is a rare, rare thing indeed. But I promised you a story about a dress! 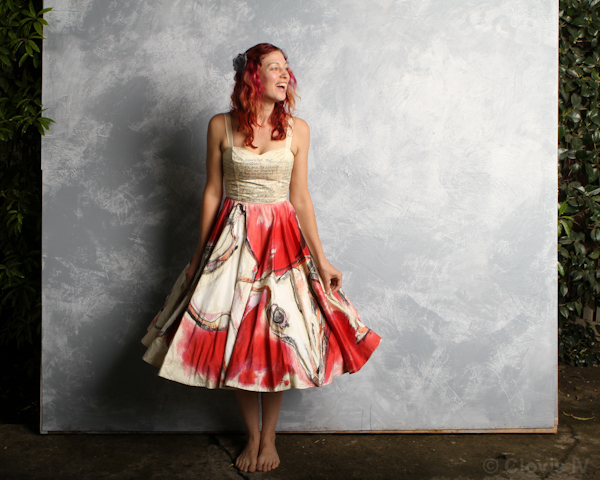 So Lise wears many artistic hats, and one of them is as seamstress. Costume designer for local theaters, and dressmaker for any occasion, Lise is amazing behind the spinning wheel of a sewing machine. 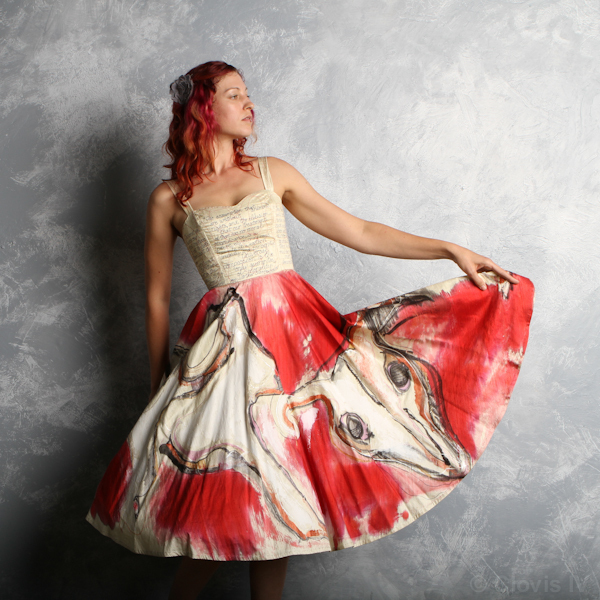 And a few years back, she was working on a series of “art dresses” to show in a local gallery. Right around that time, Lady Gaga wore a meat dress to the VMAs. For me the reason for my “Shame on Lady Gaga the Anti-Meat Dress” comes down to this: until we acknowledge that we have caused and are causing every moment tremendous and undeniable pain and suffering to millions of animals, we will never be free of worry, we will never be happy, we will never sleep in peace. The very thing that enables us to turn away from our cruelty and continue, the very attitude that allows us to look away and justify our actions, the very ability we have to blindly pursue our own lusts over other animals lives-allows us to live unkindly as people, unfairly as citizens, and inhumanely as fellow passengers. And this dress is my VERY SMALL, tragically insignificant attempt to be a STRONG AND LOUD voice in this world moving too fast for its own good and too selfishly for its own survival. 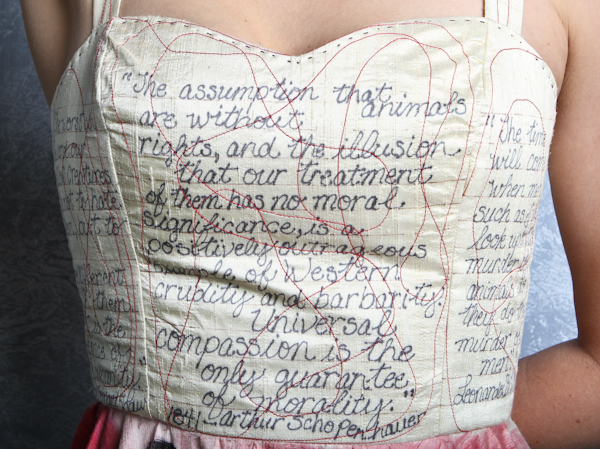 The bodice features hand-scribed quotes from the likes of DaVinci, Einstein, and Schopenhauer. But did you notice the material it’s made out of? Silk. This story has many layers. Because Lise poured her heart and soul into an animal rights dress, and she constructed this incredible piece of art out of silk. And when she was done she offered the dress to PETA, to auction or keep or do with as they wished. And they . . .
. . . said no thanks. Because the dress, you see, is not vegan. I was so honored to be able to wear this incredible piece of art. And I’m happy to announce that Shame on Lady Gaga the Anti-Meat Dress is currently for sale, with ALL proceeds going to animal rights charities. Bidding starts at $300, please email me at info AT bonzaiaphrodite DOT com to make an offer. Thanks so much to the amazing Lise, for allowing me to wear your dress and share your story. Read Lise’s blog here. And special thanks to Clovis IV for the incredible photos! Lise sounds like an incredible woman. It’s so inspiring to come across people out there who are so passionate, committed, and like you say, authentic. The dress really is beautiful and you’re the perfect model for it! What a beautiful dress and story! Lise sounds like an amazing woman, how lucky you are to have her in your life. Wow, I would totally wear that dress! It’s gorgeous and I love that it’s an animal rights work of art, as well. The handwriting/quotes across the bodice are a nice touch. The story surrounding the making of the dress makes it even better :) Inspiring! Great photos, dress and story! I think it’s acceptable to use silk if it’s second hand. After all, doesn’t it honor those animals more to be used for such a worthy cause rather than have the material thrown out? And that also educates about re-use. Sayward, what are the measurements? People might like to figure out if it would fit them. I hope the dress does well! Powerful statement, Lise. I hope none of the charities are PETA. What hypocrites they kill cats and dogs themselves. And the hits continue FABULOUS SAYWARD, which only increases my sense of worthwhile because so many have read what I wrote about our animals!! THANKS TO YOU!! Love always!! xoxo!! Andrea, I totally agree! 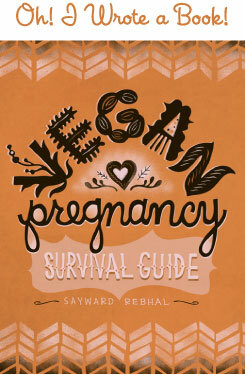 I’m always looking to include more of the “lifestyle” aspects of veganism into the blog. I love food of course, but there’s so much more to living consciously than just food! Thank you – I just felt so honored to be able to wear it! Thanks Kylie, and yes I am lucky! I’m working on getting the measurements, sorry! If it helps, the dress is definitely a size “small” – I usually wear a medium and it was very tight, almost too tight to zip all the way up. I’d say it’s like a size 2-3, but I’m hoping to get the exact measurements soon. And re: used silk, I definitely had no ethical objection wearing this dress, especially considering its story! I love this story, and the dress. In fairness—they euthanize animals with zero hope of adoption, which to me isn’t at all the same. used silk is not a problem?? really? 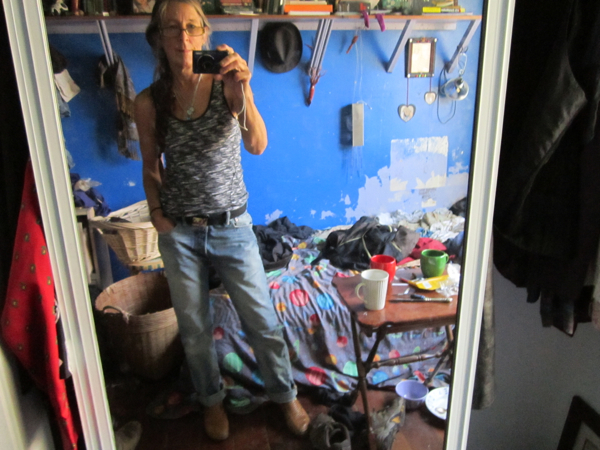 … so used leather, feather etc. must be fine too.. eh? I donť get this twisted ethics.